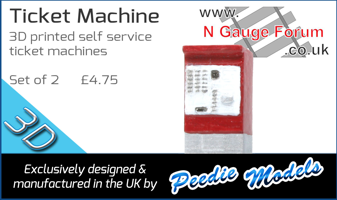 N Gauge Forum is committed to ensuring that your privacy is protected. Should we ask you to provide certain information by which you can be identified when using this website, then you can be assured that it will only be used in accordance with this privacy statement. N Gauge Forum may change this policy from time to time by updating this page. You should check this page from time to time to ensure that you are happy with any changes. This policy is effective from 25/5/18. Cookies and other tracking scripts. -We may periodically send emails about new posts, special topicsor other information which we think you may find interesting using the email address which you have provided that you have subscribed to within this forum. -It is your choice within your own profile to select what personal data (eg age and location) other members of this forum and guests may be able to view. If you believe that any information we are holding on you is incorrect or incomplete, please email us at Contact@NGaugeForum.co.uk as soon as possible. We will promptly correct any information found to be incorrect. As a valued member of our forum (or new member just signing up! ), we would like to continue to keep you informed about the posts and topics we have on our site that you have already (or will in the future) select to be notified by email correspondence on. However to do this we need your permission to continue to contact you by email and to keep any personal data you have selected to share with the site and other users of this site (such as personal email address, date of birth etc). By clicking on the "Agree” box below you agree to the above terms relating to privacy and GDPR. Should you not agree then please click the “do not agree” box below and close your browser. Your account will revert to a data-less guest within 60 days, any personal details will be removed. Between this date and the end of the June 2018 you may receive notifications on topics you have subscribed to prior to your account and any personal data we held for yourself being deleted. Your old account will be turned into a guest account to preserve the forum postings and only the visible username kept to keep threads legible. All personal data related to account including email address, any social media accounts, age, date of birth and ip related data will be removed. Should you decide that you actually do want to stay with us, then on next loading the forum please click on the “agree” box to accept the terms above and your account will not be removed.